Montreal, June 21, 2018 – Équiterre, Farm to Cafeteria Canada (F2CC) and the Whole Kids Foundation (WKF) are pleased to announce that ten Québec schools have been chosen to receive Farm to School Canada grants of up to $10,000 each, to bring more local harvest onto the plates and into the minds of their students. In its second edition, the Farm to School grants program, financed by F2CC and WKF, has expanded into Quebec for the first time with additional financial support from Québec en forme. 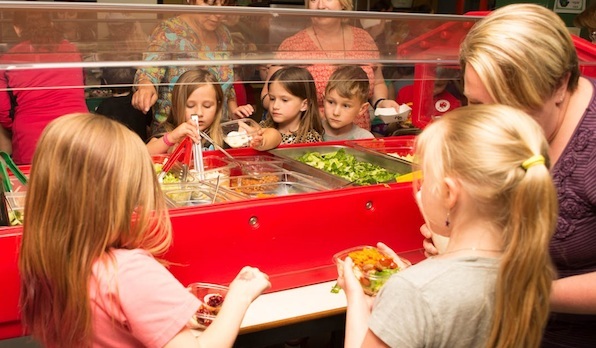 Over the next two years, the program will enable schools to engage their students in growing, harvesting, cooking, preserving, purchasing and serving healthy local foods, which will be available in a salad bar meal service. As the regional lead for F2CC, Équiterre will guide and support the five primary school and five secondary school recipients in Quebec in the implementation of the program. Équiterre has been actively involved with F2CC since in it was established in 2011. By providing students with both quality nutrition in the cafeteria and hands-on food education in the classroom, while simultaneously supporting the local food supply chain, Farm to School is a full-circle win for students, communities, local farmers and local food economies. A recently-released report from F2CC, WKF, and the Social Planning and Research Council of British Columbia (SPARC BC), Raising the Bar: A look at the early impact of the Farm to School Canada Grant program, goes into detail about the significant impact that the Farm to School program had on the first round of grant recipients. These initial grants also served as a catalyst for additional investments to come from NGOs as well as the Government of Canada, bringing multiple partners to Canada's Farm to School table, as the value of bringing healthy, local food into schools is increasingly becoming recognized. Findings from the comprehensive evaluation of these Farm to School initiatives will be shared at a National Farm to School Conference taking place in Victoria, British Columbia in the Spring of 2019. Farm to Cafeteria Canada is a pan-Canadian organization that educates, builds capacity, strengthens partnerships, and influences policy to bring local, healthy, and sustainable foods into all public institutions. Farm to Cafeteria Canada is proud to lead the national Farm to School movement. Whole Kids Foundation, a Whole Foods Market foundation, is based in Austin, Texas USA and operates as an independent, non-profit organization. By empowering schools and inspiring families, the Foundation aims to help children reach optimal health through the strength of a healthy body fueled by nutritious food. Équiterre provides concrete solutions to accelerate the transition towards a society in which individuals, organizations and government make ecological choices that are both healthy and equitable. Québec en forme’s 100° is a gathering place where people can exchange and share ideas about promoting a healthy lifestyle among Quebec youth.